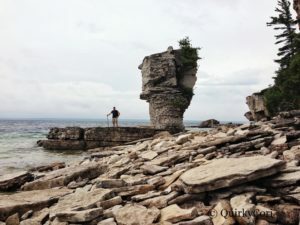 Having just returned from our wonderful trip up to Ontario’s Bruce Peninsula, I felt it was important to share some of my insights of this fantastic meeting of rock, trees and water. Here are my top 5 reasons to help you get off at Flowerpot Island. 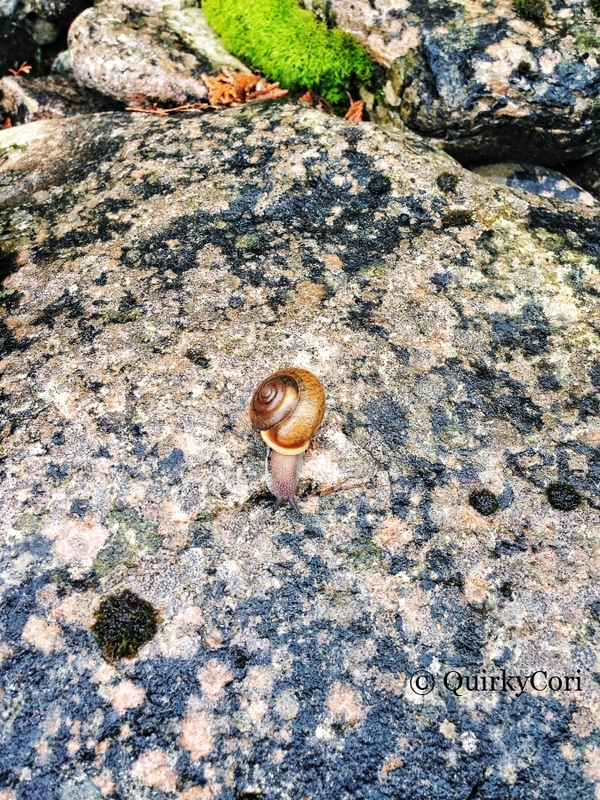 This snail was found on one of the rock beaches near the lighthouse. Flowerpot island is nothing if not green and lush. 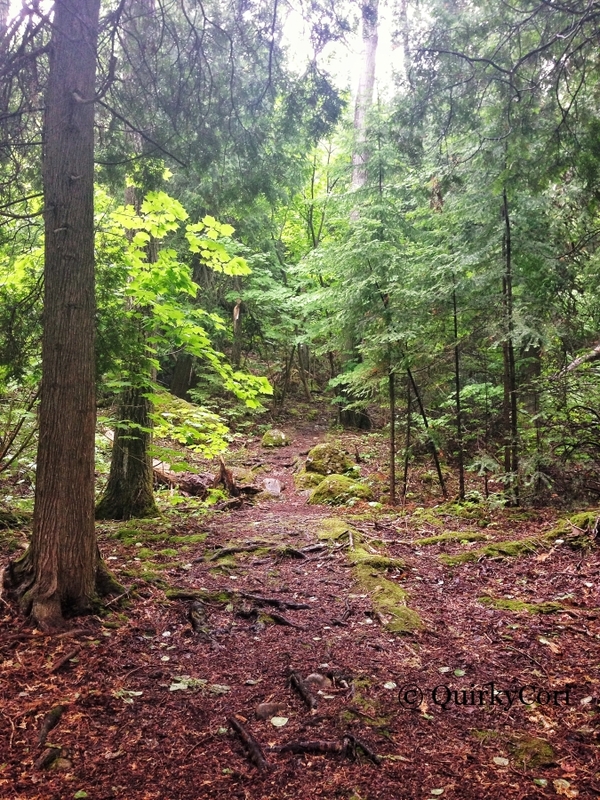 The bush surrounding the trails is so tightly covered that it makes each discovery a special treat. While we wandered the trails we kept our eyes peeled for one of the many garter snakes the island is known for. Strangely, we didn’t see any. We did see several of the red squirrels running this way and that, up and down the trees often surprising us and making us laugh. I cannot think of any where else where I have seen so many ferns growing wild. The layer upon layer of green were broken up by little hints of colour from floowers including orchids. As we were walking down one of the trails, we came across a pile of tiny pink petals. We kept looking up and down and all around to see what could’ve left them as the pink stood out clearly against all the green, brown and grey. 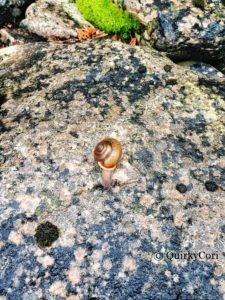 The only other living creature (besides us humans) we found was some snails. With the rain they were out in abundance and I took a picture of one of the little guys coming down a rock near the area where I slipped and skinned my knee. Word to the wise, don’t try climbing big slippery rocks in the rain without kneepads! Boarding from the tip of Tobemory, the Bruce Anchor Cruise boat can be seen with the Big Tub Harbour Lighthouse in the background. Not only does it feel awesome taking your land legs and climbing onto a sturdy boat that is going to take you across a big body of water, but you also get to see below the surface where some of the shipwrecks lie as part of the Fathom Five Marine Park. 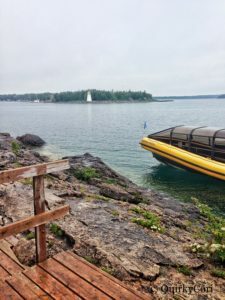 There are pros and cons to all of the charter companies offering glass bottom boat service to Flower Pot Island and I have used two of them. For this trip, we used the Bruce Anchor Cruise Company which docks directly at the tip of Tobermory. The dock overlooks the Big Tub Harbour and the Big Tub Harbour lighthouse. Within minutes of setting sail we were directly over the remains of the Sweepstakes. Built in 1867, the ship had sustained hull damage off the coast of Cove Island in 1885. It was towed into Big Tub Harbour for repairs but the damages were too extensive. They stripped her down and let her sink where she lay. It seemed surreal to be a few feet above a 119′ schooner, but there we were. A few feet away, lay the City of Grand Rapids shipwreck. Also a part of the Fathom Five Marine Park, the City of Grand Rapids caught fire in 1907 while in Little Tub Harbour. It was towed into Big Tub Harbour as it was less populated and they didn’t want any other ships to catch on fire. The ropes used to pull the double decker passenger steamer caught fire as well and her final resting place ended up being only 6-10 feet deep. Pieces of the boat can still be seen above the waters edge. Even without scuba gear you can get up close and personal thanks to these glass bottom boats! 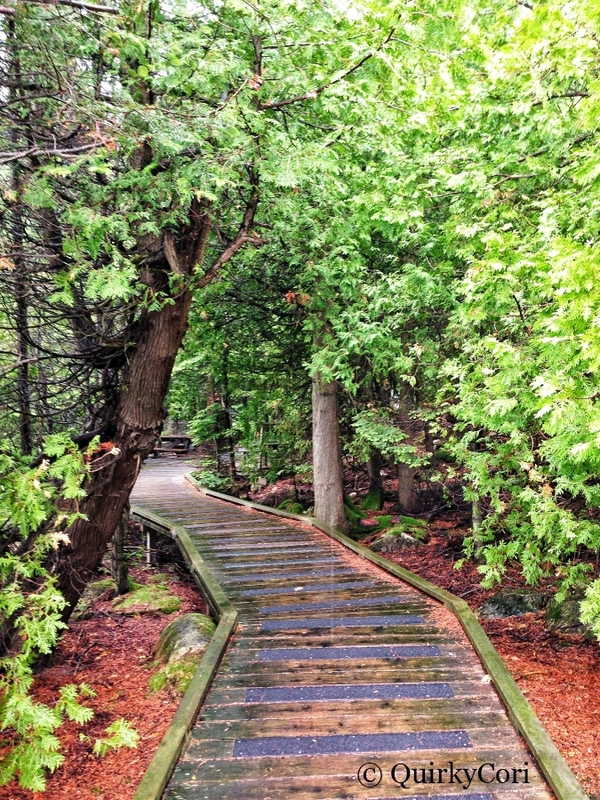 Murky sections of Flowerpot Island trails are covered by a boardwalk. Flowerpot Island is fantastic to see by boat, but it’s even better when explored on foot. Trails of varying difficulties run throughout the island. The easiest involves taking the Loop Trail from Beachy Cove (where the boats drop off passengers) past the flowerpots to the Lighthouse Keepers Homes. There you can stop and have a picnic, get snacks and explore the beach. To keep it easy, head back the way you came but for more of a challenge, you can head in the opposite direction to take a loop around the remainder of the trails. My husband and I went in the complete opposite direction of everyone on our boat. We wanted a challenge, even if it was raining. We walked passed the overnight campsites on the island which are located on wooden platforms in the forest. Some trails led up steep hillsides, where the only way up is by wooden staircases, others involved large steps to get by objects. For the most part, the trails were easily traversed, even by those with only medium level hiking experience as I do. I found having a walking stick handy was the best option when traversing the trails on a rainy day. Luckily these are provided on the dock as you depart your boat but this doesn’t mean it doesn’t hurt to have your own walking stick when you arrive. In the summer on a sunny day, the island can be teeming with tourists. For out trip however, we were lucky to be the first group to arrive on the island and there were plenty of walking sticks to chose from. 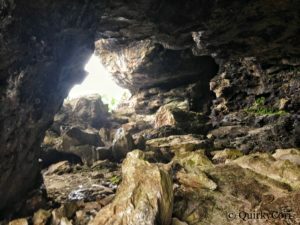 Located near the highest point in the island, the inside of this large cave can only be seen by traversing a series of stairs. Having been to the island before, I remembered there were caves but I don’t believe I remembered how much of a challenge it can be to see them. Indications of small caves are all over the island, but the largest you can see from the trails takes some guts to get to. Climbing a series of stair cases that appear to go higher and higher as you turn the bend, you end up at a platform in a large rocky cave. A platform with benches allow visitors to sit down and marvel at the sheer size of the cave, how high up it is on the island and how high you have climbed. 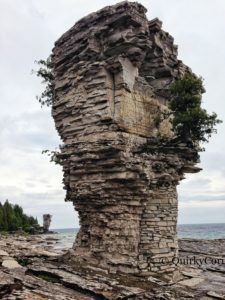 Per the website FlowerpotIsland.ca: ” These caves were formed after the last ice age approximately 12,000 years ago when the glacial Lake Algonquin completely covered Flowerpot Island. As the lake levels fell in stages, the cliffs were exposed the eroding effects of the lake for varying durations of time. This phenomenon caused numerous caves to form in the cliffs in various sizes and locations throughout the island. The Flowerpot Island sea stacks have become an icon of Ontario and of Canadian pride. The absolute number one reason to visit Flowerpot Island is the giant flower pots. Okay, they aren’t really flower pots. These tall sea stacks along the shore line have become iconic with the area of Lake Huron and Georgian Bay. Jutting out high from the rocky shore, the grey and brown columns stand testament to the power of the elements to shape our landscape. Over thousands of years, wind, rain and ice hammered away to help create the structures you see today and if you look closely, you can even see some new flowerpots are being formed along the coastline. The sheer height of the flowerpots is impressive, although they are not always as it seems. Upon closer inspection on the smallest sea stack, which believe it or not is the one in the forefront of the picture above some repairs were done. The water facing side has been put back together using stone and mortar! We ended up talking with a Parks Canada employee who was sad to admit it was true. He stated the way Parks Canada believes in conservation now, the flowerpots would be left to the elements. There are so many other words we can use to describe the island: peaceful, serene, stunning, gorgeous, multi-faceted, historical, natural, welcoming, foreboding, unique and rocky. No matter how you describe it, I strongly feel that it is the mandate of all Canadians to get there. Flowerpot Island is a national treasure and as with many parts of Ontario, it is yours to discover. Those crisp blue waters meeting with the rocky shore. As a child, my family made taking vacations together a priority, even if we didn’t have a lot of money. Every summer my parents would book a week off and we took off in the car. 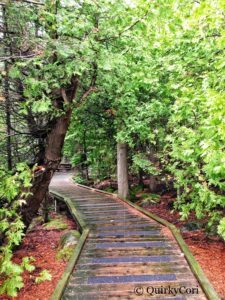 Sometimes, we did the day trip thing, and other times we went on further adventures and stayed in motels but no matter where we went – it was always in Ontario. Ontario, the land we call home. We hit the open road as often as we could. Sometimes we would bring our bikes, and sometimes we would just all pile in and head out not knowing where the adventure would take us. On occasion, we would end up in places that resonated on our minds for years to come. The Bruce Peninsula including the town of Tobermory count as one of those places. Located on the Canadian Shield, the shores of the lake are met by smooth rocky shore. Trees have been fighting through the cracks in the rock to create forests. Glacial waters have carved the shoreline to create beauty between Lake Huron and Georgian Bay. Heading out from Tobermory to that special place called Manitoulin Island is the car ferry, the MS Chi-Cheemaun. 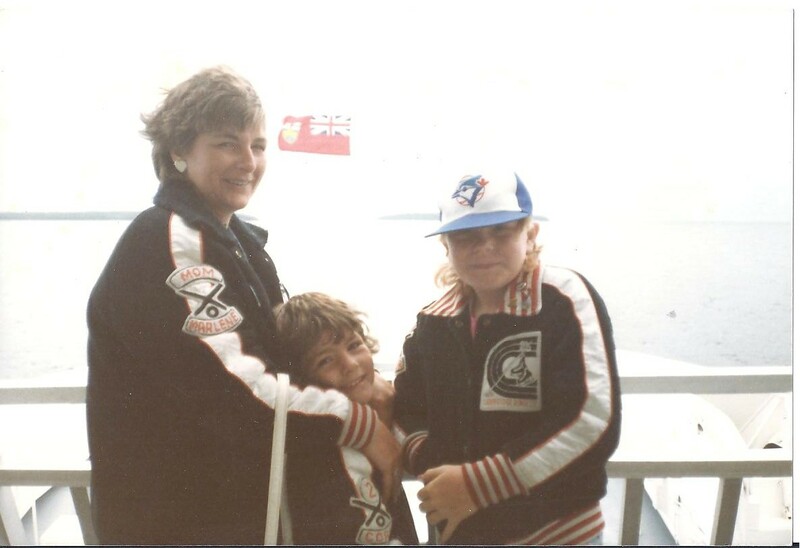 When I was about 8, my parents, sister and I went on a family vacation north that included riding on this ship. I remember sleeping in the van and waking up in the belly of the ship before heading above-board. This was my first time ever being on a boat, let alone a gigantic car ferry. The wind was cold, the day was cloudy, but it was still incredibly exciting to look out over the water as we raced across to the next port of call. We were headed towards the Soo, aka Sault Ste. Marie and this was the fastest and most fun way to get there. When I was in my final year of high school at GCI, I happily signed up to be part of the camping group in our gym class. A huge group of us took off to Bruce Peninsula National Park where we would explore the Bruce Peninsula once again. It was September. Days were warm, nights were cold but it was perfect. We hiked from our campsite over rocks to the lakeshore and discovered the Grotto. Oh the Grotto. How amazing and gorgeous and stunning and magical. I really can’t describe it any better myself. 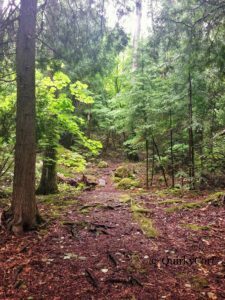 It was here in the Bruce Peninsula that my love of hiking really started to grow. So many areas are inaccessible by car and there is nothing more satisfying than feeling the slight burn in your legs as you explore. 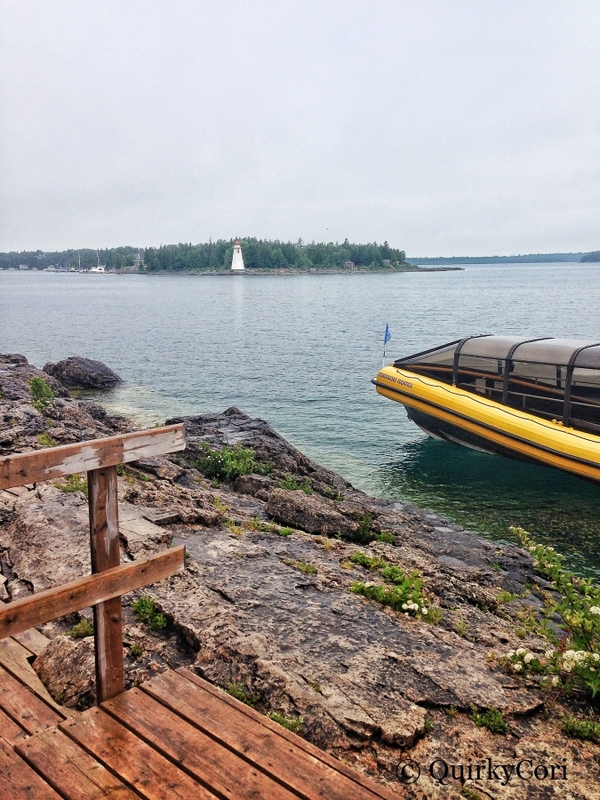 Also on my high school trip to the Bruce Peninsula, we headed into Tobermory to hope on a glass bottom boat. Yes, I said Glass Bottom Boat. A boat with areas of glass in the middle floor that allow you to see what is underneath. Trust me when I tell you, it is absolutely imperative to keep your eyes out as looking through the floor you may experience what scuba divers relish finding – ship wrecks. Loads of them. The area around Tobermory and the Bruce Peninsula is known as the Fathom Five National Marine Park. The park preserves 22 shipwrecks and several historical lighthouses, one of which is found on a layover of the glass bottom boats, Flowerpot Island. Flowerpot Island is home to natural sea stacks, caves and historic light station and a variety of rare plants. It is only accessible by boat and the day we rode into the island, it was drizzling and a storm was moving in. We packed a lunch in our backpacks and made out to explore the island as fast as we could. The storm would make it impossible to get off the island at a certain point so we all had a very specific timeline to explore. I do remember seeing the Flowerpots and being in disbelief that these giant stone columns could be naturally made, formed over many years as wind, rain, waves and ice hammered away at the island’s cliffs. The softer rock eroded more quickly, leaving the tall spires of harder rock remaining in the shape you see today. Even looking at pictures online now, it looks as if they were placed like bricks, a man-made phenomenon instead of the natural one they actually are. The caves on the island, though cool, were nothing in comparison to Fat Man’s Misery near Collingwood and I wasn’t nearly as impressed with them as I should have been. I wanted to get out and hike. I wanted to get through the woods, up and over the rolling landscape. I felt completely at peace with nature on that island and was enraptured by the tranquility of it all. It’s no surprise that this many years later I am feeling the pull to go back there again. The past few years my husband and I have explored areas of the US along the border to Ontario, even going as far as driving out to Massachusetts and seeing the Atlantic Ocean. Those trips have been fantastic, but I think it’s time to get exploring Ontario again. After all, it is mine to discover. This summer, I’m grabbing my new hiking boots and I’m going to head up to the Bruce Peninsula. I’m going to share its wonders with my husband and I’m going to make sure I have my camera. Pictures are worth a thousand words, and Bruce Peninsula is worth 10x that.